There’s a crucial design fault to one of the best snack dishes invented: the person who pulls off the first tortilla chip usually snaffles half the melted cheese. I'm always reminded of Linus dolefully dragging his blanket behind him when I see a great sheet of Cheddar vanishing from the top of the nachos pile into one lucky person's mouth. Arguments break out in our house for this reason whenever I make stacked nachos for my sons and their friends (which I do quite often, because this dish could have been designed with famished teens in mind). 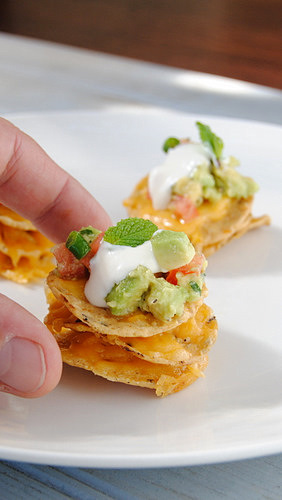 I've solved the problem by making vertically stacked nachos towers which guarantee that each person gets all the molten cheese she or he deserves. This is a somewhat fiddly recipe because you need to line the muffin tins with paper strips to make them easy to lift out, and so they won't stick, but it's well worth the effort. These also make a good snack to go with drinks because you can assemble them an hour or two ahead and sling them in the oven when your guests arrive. Make the avocado topping no less than an hour before you're going to serve it, and feel free to brighten it up with interesting ingredients of your choice - bottled chillies, fresh coriander, crumbled bacon, and so on. Heat the oven to 180ºC. Lightly oil a large sheet of greaseproof baking paper on one side and cut it into 24 strips each 25 cm long and 3 cm wide. Now lightly oil two 12-serving muffin pans. Line each pan with a strip of paper, oiled side up, by pressing the centre of strip across the base and sides, allowing the two ends to poke up out of the pan. These strips will let you lift out the nachos, and prevent them from sticking. Coarsely grate the cheese on big board and divide it into 24 equal little piles. Press down lightly on each pile. Each stack will use 3 servings of cheese. To make a stack, put a chip on the board and top it with a pile of cheese. Add another chip, and another pile of cheese. Add a third chip, and top off the stack with a third serving of cheese. Press down very lightly. Drop the stack into a lined muffin pan and repeated with the remaining chips. Bake at 180ºC for 7-10 minutes, or until the cheese has melted. Put the lemon juice in a bowl. Remove the flesh from the avocados, cut into neat 5 mm cubes and toss them in the lemon juice. Cut a cross in the tops of the tomatoes and put them in a bowl of boiling water for 3 minutes. Slip off the skins and dice neatly. Add to the bowl along with the chopped chilli and coriander, mix gently together and season with salt and pepper. Remove the stacks from the muffin pans and gently peel away the paper. 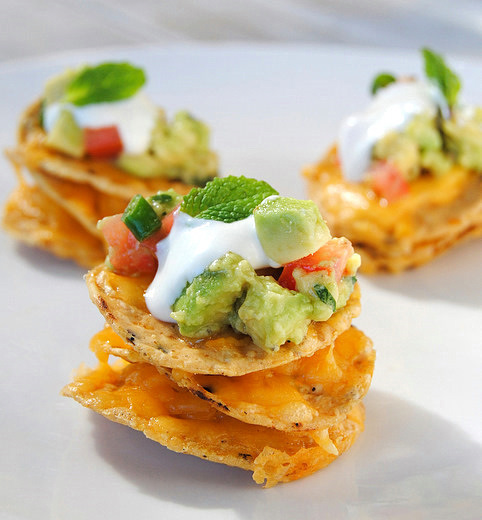 Arrange the stacks on a platter and top each one with a tablespoon of the avocado mix, a blob of sour cream, and a small mint leaf. Serve immediately. Your presentation is gorgeous! If I had cheddar cheese, I'd make this right now :) Thanks for sharing! now, i'll get the cheese instead of just tortilla chips! And it looks classy too!